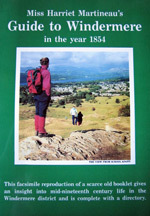 Miss Harriet Martineau’s Guide to Windermere 1854 was penned in response to sweeping changes in local life which came with the railway to Birthwaite, re-named Windermere, soon to blossom into. This facsimile reproduction of a scarce booklet gives an insight into mid-nineteenth century life in the Windermere district and is complete with a directory. Harriet was one of the literary celebrities of the time, and her prose is still as fresh now.